So much goes into selecting just the right rug. Here we do our best to help guide that decision to the perfect area rug. The things to consider include, design, color, size, shape, material and construction. Traditional: Traditional rugs are comprised of two sections: the border and the field. The border is the main decorative design that surrounds the rug. Some rugs also have guard borders– narrow decorative designs adjacent to the main border. The field is the area of the rug located within the borders. This can sometimes contain an all over pattern or a medallion, which is most often a round, oval, or polygonal design. These two parts are also important in identifying the rug. The dominant color in the field and border respectively end up in the name of the rug (i.e., IND-01 Red/Gold). Red is the dominant color of the field and gold is the dominant color of the border. Transitional: Elements of traditional designs used in a modern way make transitional rugs so poplular today. From distinct traditional influences to whimsical florals the definition of transitional is broad. Contemporary: Geometric, curvilinear, abstract, whatever the design as a style contemporary is unmistakably modern. Be it bold colors with modern designs, textured or tonal solids or even natural materials such as jute, sisal or hemp this category is fun, broad and open to interpretation. It is easiest to make the rug the first piece of a project or room design as this will help define the color palette and style that the room or project will take on. If this can’t be done it is not problem as picking a rug to fit into a project can also be an easy task, what you’ll need are the dimensions of the room and any furniture pieces, samples of your fabrics, paints woods or anything else that may have color or texture. Take a good look at the room where you’ll be putting the rug. Use color to create the effect you want. If you want to make the room look larger, use a lighter-colored rug; if you want to make the room look small and cozy, go for darker colors. If you are beginning the room or project with the rug then picking color becomes a no-brainer; pick the rug you love and run! However since most times the rug is picked with or after the furniture or paints care must be taken that the rug flows into the design and helps to enhance it. Since most times the furniture sets, especially the large pieces, will be done in a solid fabric with accenting pillows or even an accent chair there can be little trouble choosing a rug that coordinates. It is usually recommended that the furniture and the rug are contrasted, light furniture, darker rug, darker furniture, lighter rug. This is a great way to make each piece stand out from the other without becoming the focal point in itself. Don’t be afraid to consult a color wheel. 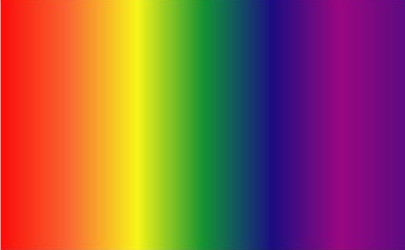 Color wheels are a design tool, a wheel with twelve colors showing the various shades and hues of each of the main colors. You can use the color wheel to help develop several different decorating themes. Monochromatic color schemes use a single color in different shades throughout the room. This can be dramatic and effective. Harmonious color schemes use several colors right next to each other on the color wheel; as the name indicates, these color schemes give the room a peaceful feeling. Complementary color schemes use two colors opposite each other on the wheel, like red and green: while this color scheme might be too loud for some people it is a great way to add drama to a space. When choosing colors for the room it always best if paint choices are left for last. As paint is the most prevalent in number of choices and by far the least expensive (the brightest orange costs the same as the whitest white) this should always be done last and chosen to finalize the room. When in doubt always consult The Rug Shop or a Schneiderman’s designer for tips and guidance! FREE 48 HOUR HOME TRIALS ARE AVAILABLE TO HELP SET AT EASE ANY COLOR DOUBTS! The ever elusive ‘what size should I use?’ Generally speaking in terms of size the bigger the better; however in many cases the room will determine our size in unexpected ways. For example care must be taken not to cover in floor venting or electrical outlets, also ‘jogs’ in the wall should not be too close to the rug as to impede on it’s impact. Here in the West we have adopted rugs to be a part of our design of the furnishings rather than the room. As such we commonly choose rugs in the sizes that will anchor our furniture grouping alone. This typically means in living/family room settings we are using 8×10, 8×11 or 9×12 rugs that have been chosen to have the front legs of the furniture sit on the rugs. In this application it is always best to go as large as possible as this will create a greater impact and look more complete. (Moving the furniture forward on the group so as to cover more of the rug can create a more intimate setting whereas moving the pieces back on the rug and exposing more of the rug will create a more open feel creating a ‘larger’ space) A larger rug will make a room or furniture set seem larger as it will draw out your focal point. Conversely using a smaller rug will make a room or setting seem smaller as it allows your focal point to narrow. When using 5×8 or 6×9 rugs in these rooms be careful not to choose table and accessories that are too large in scale as this will only make the rug seem even smaller and have much less impact. When using the smaller sizes if possible any tables used should have a glass top or no shelf to keep from covering the rug and making it disappear. In dining rooms it is important that the rug is large enough so when in use the legs of the chairs are comfortably on the rug, but not so large that it overtakes the room. As a general rule adding 24″ to each side of the table will accommodate these. (i.e. a table that is 40″x60″ would use a rug that is at least 88″x108″ (8×10) Also be sure to measure any leaves that will be used as well to ensure that the chairs will be accommodated with their use as well; sometimes it’s better to go 8×11 than 8×10! The images below are a great example of the different sizes that can be used. A look at what sizes to be used in various settings and rooms. All dining rugs should accommodate all the chairs when in use. 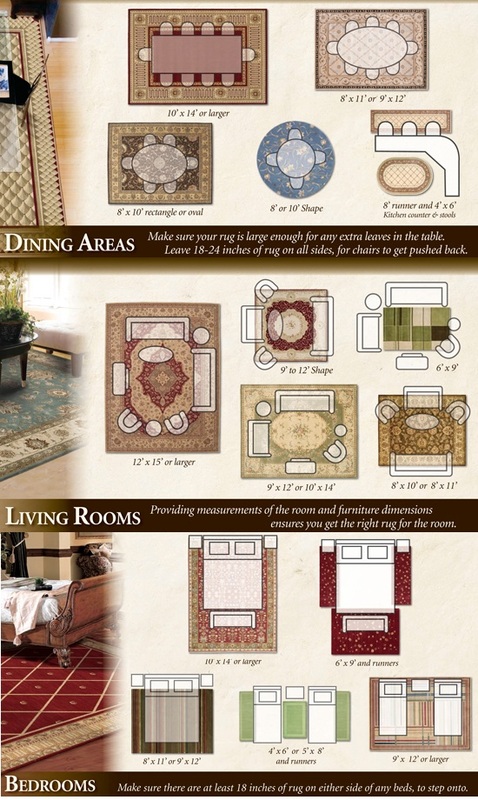 Because the different regions tend to use rug sizes in different ways rugs are often produced in limited sizing. Contemporary and transitional rugs for example are often made no larger than 10×14 (usually only 9×12) as these are commonly produced to be sold on the Western market. Traditional rugs however are often made in many large or ‘carpet sizes including 12×15, 12×18, 14×20 and even larger. Once you’ve made your mind up on size it is important to note that common sizes vary depending on how the rug is made. Power-loomed or hand-tufted rugs are more commercially produced, often in bulk, and as such are typically only made in 3’6″x5’6″, 5’x8′, 8’x10′ or 8’x11′ though they can be available in 9’x12′ or 9’6″x13’6″. Hand-knotted rugs are much more labor intensive and can be made in commercial weave houses as well as cottage industry and will generally be made in picture frame sizes, 4’x6′, 6’x9′, 8’x10′, 9’x12′, 10’x14′, 12’x15’ etc. For those very specific size needs there are many custom options. If there is a question as to how a particular size will work in your room click here to build your room to scale and insert rugs of various sizes to see how each will look. Many materials are used in today’s rug production with experimental materials being tested constantly. Though wool has been and remains the fiber of choice silk also remains popular, many of today’s rugs are produced using synthetics such as polyester or poly-acrylics. Many natural materials are gaining popularity as well such as bamboo, hemp, banana silk, nettle, jute, sisal and other natural plant matters. These can be used either as accents or as the pile itself. Below we discuss some of the qualities of these materials. Wool: the textile fiber obtained from sheep and certain other animals, including cashmere or mohair from goats. Among its many advantages is its incredible durability, unlike other materials, including nylon and bamboo, wool rugs resist crushing from furniture and heavy foot traffic. Because of the natural spring-like texture of wool fibers, wool rugs bounce back even after washing, retaining their beauty and form. Wool resists stains and dirt because of a natural wax-like coating on the fibers, known as lanolin. This lanolin repels liquid and dirt, keeping it on the surface where it’s easy to clean with cold water and a sponge. The amount of lanolin in a particular wool fiber is depending on a few factors; the breed of sheep plays a role but the biggest effect comes from the climate and altitude at which the sheep grows. As such wools from New Zealand, the Himalayan Mountains or other high altitude regions are the most desired for rug production. Silk, the strongest of all natural fibers silk remains one of the most highly desired fibers in the world today. Incredibly strong, stronger than steel pound for pound, and very easy to clean silk is the fiber of choice in the finest rugs produced. Many silk rugs dating back hundreds of years are still bought and sold through antique auctions every year and remain beautiful pieces to this day. Jute/Sisal/Coir/Hemp Etc: While many natural plant matters are gaining popularity they lack the longevity offered with wool. However there can be benefits to using a natural grass material. Sisal, the toughest of all plant fibers can help regulate indoor humidity levels as the surface can absorb airborne moisture. As such care should be taken when used in applications where it is likely to be exposed to spills or saturation. Sisal is great for high-traffic applications but it’s course fibers make it not ideal for small children and bare feet. Coir, a by product of coconuts, tends to resist moisture and may be a better natural material for such applications. Jute, taken from the stalk of the plant instead of the leaves jute rugs tend to be softer than some other natural fiber rugs but are less durable. Jute is best used in low to medium traffic areas. Seagrass, taken from rooted underwater grasses seagrass is a very durable fiber and can be used in an many applications so long as it won’t be exposed to the elements. Hemp/mountain grass, typically harvested by hand and processed by machine hemp is a renewable non-porous material that is both strong and durable, good for medium traffic areas. Unlike wool and synthetic rugs, natural rugs should not be cleaned with water. These rugs should be hung and beaten with a rug beater. If a vacuum is used it must be without a beater-bar, using just suction can loosen and eliminate dirt, sand and dust. If jute becomes soiled, it must be cleaned professionally without water. Hemp rugs can be cleaned with water but it may not always be effective. Prevention is the best method to preserve the quality of natural rugs. If using a jute rug don’t walk on the rug with shoes, and keep out of rooms where food and spills can permanently stain the fibers, jute is porous and tends to soak up any moisture it is exposed to. Viscose or art-silk is also a common fiber to find used in rugs, this is almost always a mercerized-cotton. Though this can give you the similar look and feel of silk at a much lower cost viscose lacks the clean ability or durability of silk. The list below covers some of the terms you may find while shopping for rugs, these describe various wool types or process’ of creating wool. Dead Wool: Unfortunately brittle and coarse, poor quality wool used in production of many high volume, inexpensive, commercially available rugs. This type of wool often will shed profusely, and render a rug lifeless in a short period of time. Dead wool is often the refuse from combing out finer, longer stapled wool. New Zealand Wool: Typically New Zealand wool is often known for its longer staple, and naturally soft feel. This is due in part to the climate, altitude and vegetation available to herds. It’s not uncommon for a rug to have a New Zealand and local wool blend to counteract the investment of import and material cost. Himalayan Wool: Himalayan wool can come from many countries the Himalayan Mountain Range passes through. The best of these come from the Tibetan Plateau. Much like New Zealand or Gazni wool, Himalayan wool comes from sheep that live at a very high altitude and have access to good vegetation. Himalayan wool is often blended with New Zealand wool and silk in some of today’s finest Tibetan weave rugs. Semi-Worsted Wool: Semi-Worsted wool is very solid quality wool which is retrieved from wool by the process of combing. After wool has been combed, finer, longer strands of wool are separated from shorter less desirable wool. The term Semi-Worsted wool refers to a wool which has been produced by one of two ways: Either the very high-grade wool (after being separated from low to mid-grade), or the highest grade wool which is separated from the lowest grade and then is blended with a medium grade wool. Worsted Wool: Worsted wool refers to a process (and product) of combing excellent quality wool from high, medium and lower grade (determined by length, or staple.) After wool has been combed, the finest, longer strands of wool are “Worsted” or laid parellel to one another, prior to being spun into yarn. This produces a stronger more durable yarn. Mohair: Mohair is harvested from the Angora Goat. Mohair is often very fine, long stapled and has a silk like appearance and feel. Mohair rugs are very unusual to come by, as mohair is a very expensive and hard to come by fiber to be used in production of Oriental Rugs. One should carefully inspect a mohair rug for color run, as it’s not entirely uncommon to find overdyeing of colors which could potentially run. What to look for: Judging the quality of wool takes many years of experience, however, there are ways for even a novice to pick up on sub-standard quality rugs. Although it’s not uncommon for a new Oriental rug to shed just a bit in the first several months, there are extended cases of shedding which are serious problems. A quick test for low quality wool is to first thoroughly vacuum the face of your rug, then agitate the pile back and forth with your hand a dozen times to see if wool surfaces. If the wool which surfaces to the pile may be rolled into a ball which is equal to or greater than the height of the rug’s pile, chances are you have a carpet where inferior quality wool had been used in production. Additionally, wool which feels “brittle,” “coarse,” “dry to the touch,” or “wirey” are also signs of a lower grade, or “less choice” selection of wool used in weaving. In the long run, this generally means the longevity, durability and appearance of your rug will be compromised. That is to say, an Oriental Rug which has a lower quality wool will show signs of wear far quicker and appear “used” far sooner than that of an Oriental Rug which implements a higher grade wool. Oriental rugs using high quality wools and other materials can remain an essential part of any decor for years and often for generations. A high quality knot will remain intact until the cotton foundation which the knots are tied to breaks down. There are many types of flooring available today and there are things to keep in mind in both design and construction when considering the use of a rug. Quite often there are those who feel that after installing their new hard-wood floors they don’t want to then cover them with a rug. While the floors can certainly stay bare there are many more advantages to using rugs. Rugs will dampen any echoes or sound that will carry throughout a house, wool specifically has incredible sound dampening qualities. Rugs also go a long way in warming floors up when used in high traffic areas. In addition to helping dampen sound and warm floors, rugs enhance the beauty of a hard-wood floor, by framing a room with a rug the floor will stand out like a picture frame making it a unique and integral addition to the look and feel of a room. While enhancing the beauty of the wood it also protects the wood from damage and wear caused by furniture, feet, pets and daily use. The use of a pad will reduce slipping on hard-wood (rugs can be very slippery!) which keeps dirt and debris from scratching the floor on the underside of the rug. The pad also protects the backing of the rug by working as a shock absorber elongating its life. Many people feel that if they have wall-to-wall carpeting they don’t need a rug. Again floors certainly can stay bare but even carpeted a floor is essentially bare. Though not bare to a hard-surface, carpeting is simply flooring and especially with regards to aesthetics, remains bare. Carpeting with designs or pattern can help offset this. Similarly to hard-wood, carpet is protected by a rug preventing wear and staining. When placing heavy furniture on a rug that is on top of carpet the rug will tend to buckle and wrinkle as it pulls toward the heavier pieces. This will happen with all rug types however machine-made and hand-tufted rugs will have their foundation stretched during this process and the ensuing wrinkles or buckles will become permanent. The use of a pad designed to be used on carpeting will help with this issue. A hand-knotted rug may develop this wrinkle but taking it in for a deep clean will eliminate this. Using low pile carpeting like that found in commercial applications will also help to eliminate this issue. Tile, marble, cement and some wood floors are run with radiant heat underneath. This is a great way to keep these surfaces warm but care must be taken when choosing a rug. Due to the increased exposure to heat rugs made using natural glues will tend to have shorter life-spans. Hand-tufted and hand-hooked rugs are made using natural latex glues which will oxidize and break down leaving behind a fine powder. Although this process is natural and will happen in any setting it is accelerated when used on radiant heat floors. The use of a rug pad (the thicker the better in this situation!) which has holes which allow for air circulation may extend the life of the rug.